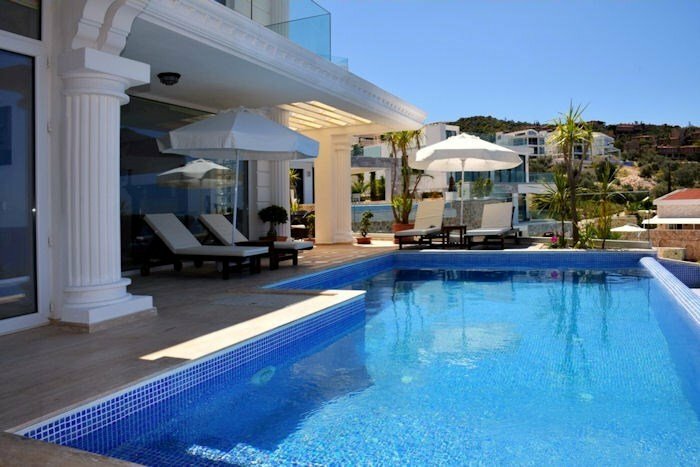 Villa Derya is stunning and arguably one of the best luxury villas in Kalkan. The villa is beautifully decorated and furnished to the highest standard throughout, and is extremely well equipped, to ensure that you can relax and enjoy your time in Kalkan to the maximum. With the highest quality fixtures and fittings Villa Derya will not disappoint you with its feeling of luxury. The magnificent panoramic views of Kalkan bay go hand in hand with offering a true fabulous almost celebrity style getaway. You can enjoy the amazing ocean views from your beautiful large infinity pool, and the pool is surrounded by a spacious patio area, equipped with sun-loungers a shower and sun-shades. There is a large rattan seating set out on the patio, with a three seater sofa, two arm chairs and a low table. There is a BBQ here as well. There is an outside dining table and chairs for eight people too so plenty of space outside to make the most of the amazing views. The villa is also very secure, with CCTV cameras installed around the perimeter of the property. The villa is located in the Komurluk area which is often seen as the most exclusive area of Kalkan. It is just a few minutes walking distance to the beach clubs, restaurants, facilities and Kalkan town centre itself. All the bedrooms are en-suite, and have large, private balconies/terraces to bring inside the stunning outdoors. The villa is air-conditioned throughout, and in the lounge there is a flat screen TV, DVD player, Wifi if you need to connect to the internet, and even an ipod dock if you want to enjoy some music while you soak up the Turkish sun. The open plan lounge/kitchen/diner is very spacious, and double French windows look out to the garden, pool and patio area, and of course, those spectacular views. The kitchen is fully fitted and equipped to a very high standard. A fabulous luxurious villa that offers a truly special holiday.